The first book in The Bern Saga. Short Summary: After Molly is kicked out of the Naval Academy, she and her training partner, Cole, set out on an adventure to find her father’s missing star-ship. During this adventure, Molly learns more about her past, while creating new friendships and adding a variety of alien crew mates to the Persona ship. 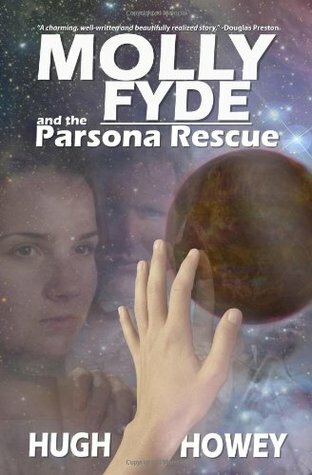 The first time I picked up Molly Fyde was after I had attempted and failed to read Ender’s Game. I had read a comparison of the two, and had heard amazing things about both. So, when I picked up Molly, I had the intention of reading it quickly and thought I would fall in love instantly. When I got around to Molly I was disappointed. I was bored within the first chapter, which is the major setting for the events and characters in the Naval Academy. The back story of Molly, and her struggle as a girl in a boy’s academy, had too slow of a pace for me to stay entertained. However, after reading another one of Hugh’s books, WOOL, I decided to give Molly another try. I’m so glad I did. I adore this saga. I sped through the first book so quickly that I rushed to Amazon to purchase the next three e-books immediately. Hugh Howey has a talent for writing. His characters are thoroughly developed and very easy to fall in love with. Every time I expected the characters to get a break from their dangerous adventures, something else would happen and their situations would spiral out of control again. If I had not picked this book up for a second time, it would not have turned out to be one of my favorite sagas of all time. So, next time you put a book down because you can’t get through the first chapter, try it again. In my opinion, this book is way better than Ender’s Game. Before reading Molly, I had no interest whatsoever in Science Fiction. Now I love it. Thanks, Hugh!